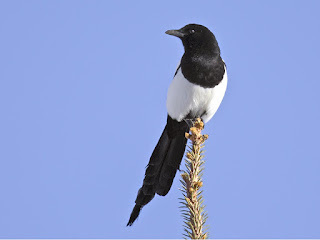 The magpie is probably the most recognized, and least liked, native bird in the American West. As a child, the first thing I learned about them was that they eat eggs and baby birds from other birds' nests. I have heard stories of them attacking the eyes of living wildlife and livestock. 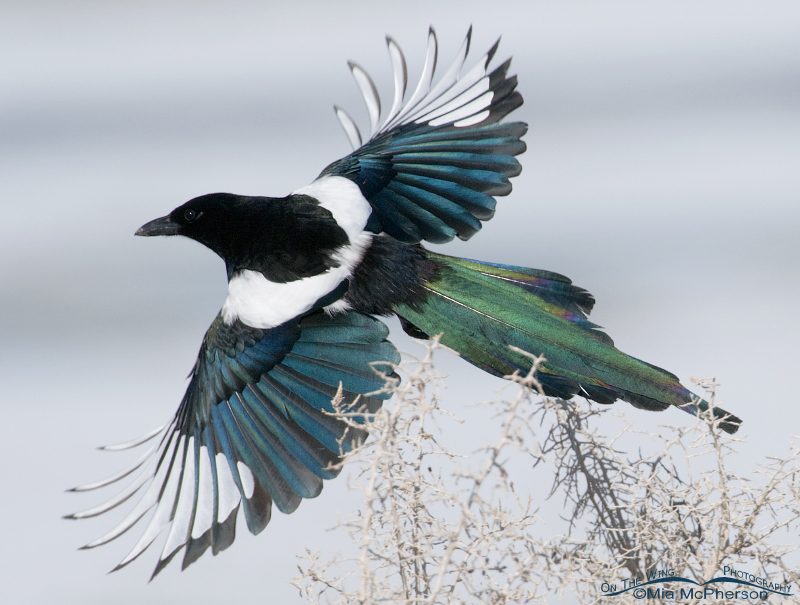 This is an Australian magpie. All of their animals are deadly. Beware koalas. Roadkill makes up a good chunk of their diets. 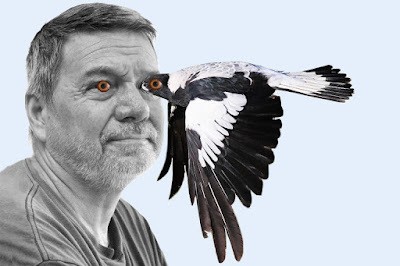 If I died hiking in the nearby foothills, my corpse would not be found by spotting circling vultures but by the sight and sound of a murder of magpies perched on the scrub oak. Yes, a group of magpies is called a murder. But there are also other terms: tiding, gulp, charm, and parliament. I prefer murder. 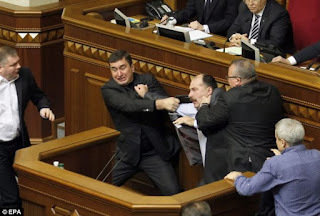 In the Ukraine, but it could be anywhere in politics. Parliament sounds a little European and distinguished for American magpies. If they were called a legislature or congress that would probably catch on. Magpies sound argumentative. Waking up to magpie "song" outside your window at 5:30 in the morning is not a Disney princess experience. But tiding may be the best term for my magpie experience this week. Watching a group of magpies "murder" the contents of my bird feeder yesterday, made me think of an omen-filled poem by Robert Frost. Magpies are in the same family as crows. The initial images of the poem--poisonous hemlock and carrion-eating crow--would usually be taken as bad tidings. yet, the crow's action made the poet's day better. This week has been bad. I haven't slept well, I'm running a fever, and the course of ordering new medication always takes a couple weeks. Most concerning, however, is the fact that the disability check sent out December 22 hasn't arrived yet. Needless to say, being short 1/3 of our income for the last three weeks has been a problem. Many phone calls have been made. A new check was allegedly sent overnight two days ago. 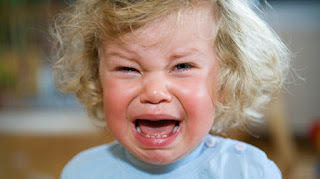 I'm not a pretty cryer. Yesterday I lost it. I cried on the phone with my insurance company person, emailed a law firm, over-shared on Facebook (sorry friends) and wrote a very angry blog post (that I'm not publishing. You're welcome). distracted me and helped lift the mood. 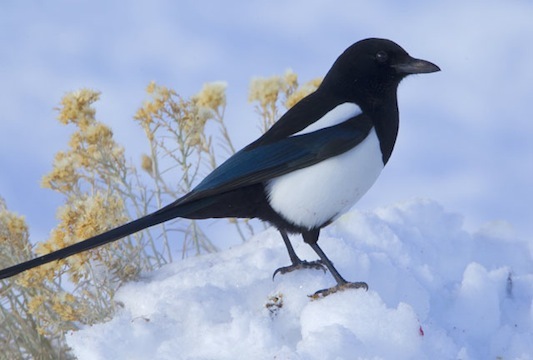 In spite of a dire reputation, magpies are beautiful birds. I relate to their folk reputation of being attracted to shiny things. I love the black and white contrast and the iridescent blues and greens in their black feathers. 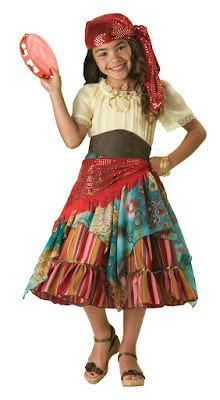 I could totally rock this skirt! 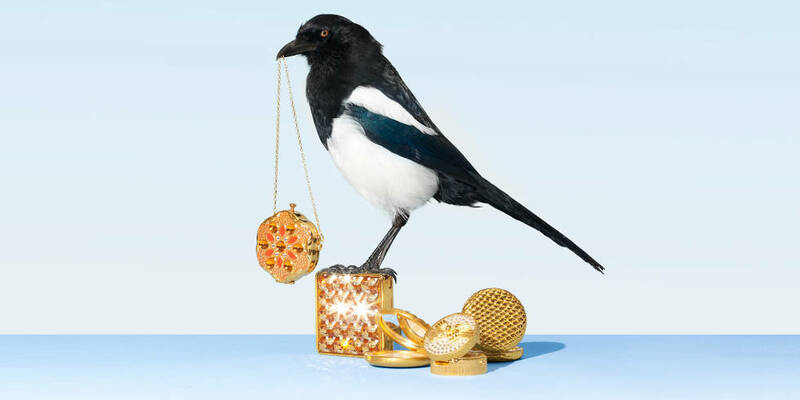 Magpies are perpetually overdressed considering the grubby way they make a living. Since I could best describe my own look as elementary school Halloween gypsy costume, I admire their sense of style. Today (Thursday) is my 26th wedding anniversary. 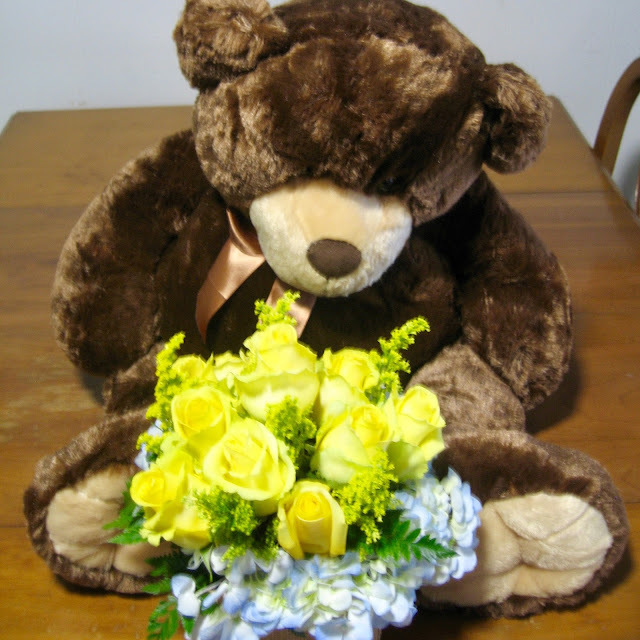 It is a day to celebrate love and count blessings. I will watch snow fall and bake cookies for my husband. Love (and magpies) is saving a part of I week I had rued. P.S. Check arrived via UPS Thursday afternoon. This week I made what is my favorite of the niece-pieces so far. The background shows our current weather: partly snowy with a chance of fog. 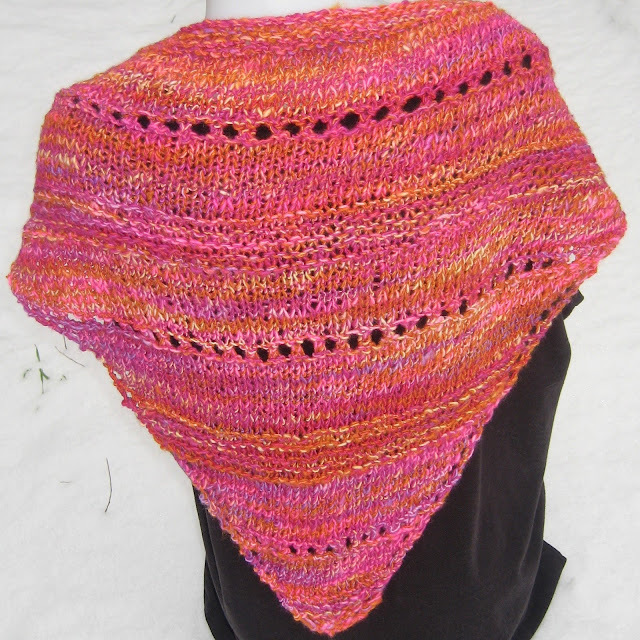 This is a simple knit triangle in fantastically bright colors that remind me of a piñata. I used leather straps for the closure on this one, which makes it a little more sophisticated. Ribbons I had considered were ruled out as being a bit too "girly." Until I give it away for a birthday or find something to match with it in my wardrobe, it will be available in my shop. I want to spotlight another great color-burst from my shop. 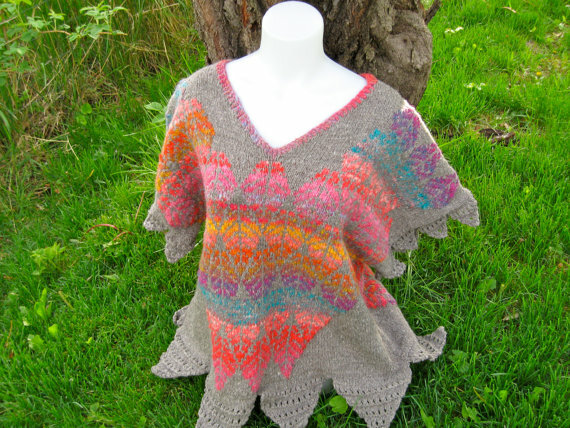 This sweater mixes neutral grey with wonderful brights. 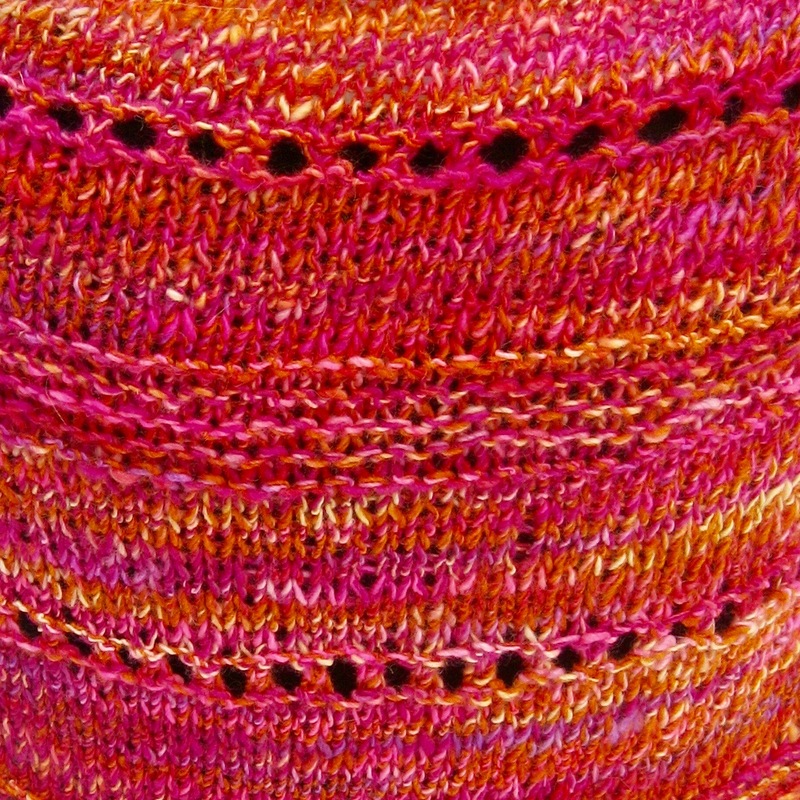 In other yarn news, I'm continuing to work on my son's complicated sweater. I'm finished with the body and one sleeve. When I finish the second, I have to get brave and cut arm holes. It should be finished and photographed next week.